Photo by Anthony Arnista for Arcata Playhouse Bigfoot Lodge: Amy Tetzlaff and Ryan Musil in Bigfoot Lodge Holiday Jamboree at Arcata Playhouse. 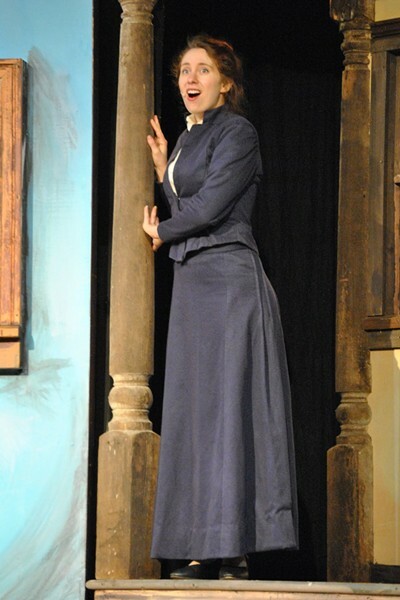 Photo courtesy Ferndale Repertory Theatre Caitlin McMurtry as Marian the Librarian in The Music Man at Ferndale Rep.
Apart from the deeper meanings, it comes down to: Christmas R toys, right? And not just for children. (Or do I have to give back my Enterprise com badge and Doctor Who sonic screwdriver?) And what's better than toys that come alive? Among the many shows that play with this idea is Victor Herbert's 1903 operetta Babes in Toyland. It's been reworked many times for stage, film and TV, and even though the original script in the Library of Congress reads like one of Dell'Arte's own shows, Dell'Arte has reworked it again for a 2013 holiday production. "We're guided by the essentials of the Victor Herbert story," said director Michael Fields. In the Dell'Arte version, the villainous Barnaby has taken over Toyland and is mass-producing terrible toys. The original Toymaster has disappeared. The various characters (including the Toymaster and a few Mother Goose figures) wind up in the Forgotten Forest, where people don't remember who they are and have to figure it out. "It's very funny, it has a happy ending," Fields said, "and there's square-dancing." As always, the Dell'Arte holiday show is made to travel, from its compact playing time to the set. "We have to create a visual world that supports the show, but with sets and lights that can be loaded in and out of a truck 17 or 18 times," Fields noted. This year's set, which transforms from various structures into the Forgotten Forest, is designed by Lynnie Horrigan, with lighting by Michael Foster and costumes by Lydia Foreman. Tim Gray composed the music and designed sound. Cast members are Andrew Eldrege, Darci Fulcher, Billy Higgins, Ariel Lauryn, Allie Menzimer, Lucy Shelby, Jerome Yorke and Emily Newton. "Some years we've gone a little dark with our holiday shows," Fields said. "But this year it's very upbeat, energetic and bright to look at, with vivid costumes and a vibrant world. It's in the genre of family theatre, which for me is a kind of European concept of theatre that isn't just for children but is certainly family-friendly." Or as Fields summed up: "It's fun. It's free." And yes, "certain toys come alive." Babes in Toyland opens at Dell'Arte's Carlo Theatre on Friday and Saturday, Nov. 29 and 30 at 7:30 p.m., then tours up and down the North Coast before returning to the Carlo for the weekend of Dec. 19. All shows until final weekend are free. You can find the full schedule in the "Holiday Heads Up" section of this issue or online at dellarte.com, where there's also ticket information for the various venues. Another annual family-friendly holiday show unfolds at the Arcata Playhouse with a comedy at the center and different guest musicians for each performance. This year it's Bigfoot Lodge Holiday Jamboree, directed by Jackie Dandeneau. It features Amy Tetzlaff and Ryan Musil as refugees from Wisconsin who come to the North Coast with their strange ways to take over the Bigfoot Lodge. Bob Wells plays the resident Bigfoot expert. Meredith Anne Baldwin and real Wisconsinite David Ferney also perform, with live music by Tim Randles. 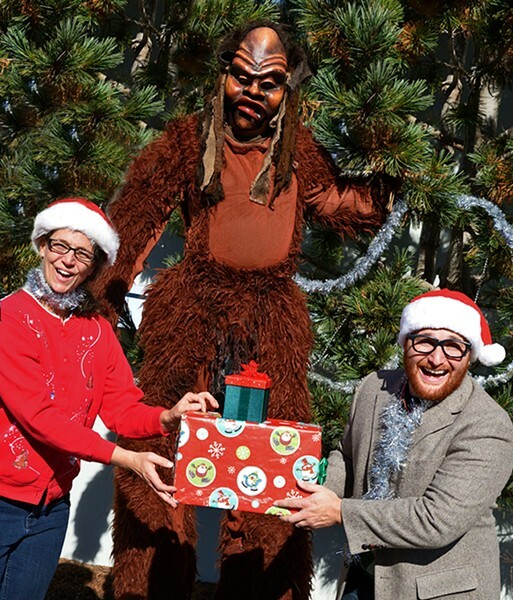 Beginning Dec. 5, Bigfoot Lodge Holiday Jamboree runs for two weekends at the Arcata Playhouse, Thursday through Saturday at 8 p.m., with a 2 p.m. matinee on Sunday, Dec. 8. Tickets are available at Wildberries Marketplace or by calling (707) 822-1575. You can find more information including a schedule of guest appearances at arcataplayhouse.org. The Music Man by Meredith Wilson (script and songs) is the Ferndale Repertory Theatre's holiday show, though probably not because Wilson also wrote "It's Beginning to Look A lot Like Christmas." It's a big, bright musical from Broadway's Golden Age, with a love story, children, a happy ending and songs you sing on your way home. Directed by Dianne Zuleger, the cast of 30 is led by Jaison Chand as the con man Professor Harold Hill and Caitlin McMurtry as his love interest, Marian the Librarian, and includes Gino Bloomberg, Greta Stockwell, Anders Carlson, Laura Rose and Tyler Egerer. Linda Maxwell is choreographer, Elisabeth Harrington and Nanette Voss are vocal directors, Karen Kenfeld Fuller is costume coordinator, and Bruce Keller scenic artist, with sound by Ian Schatz and lighting by Telfer Reynolds. The Music Man opens at Ferndale Rep on Friday Nov. 29, and plays Fridays and Saturdays at 8 p.m., Sundays at 2 p.m. through Dec. 22, with Thursday night performances on Dec. 12 (benefit for cast and crew) and Dec. 19. While "(Ya Got) Trouble" ("right here in River City") and "Seventy-six Trombones" are probably the songs most associated with the show, the tuneful score also includes "Till There Was You," most famously recorded by the Beatles in the early 1960s. They didn't know it came from The Music Man, but Paul McCartney (who sang it solo) found out— and eventually bought the rights to all of Meredith Wilson's songs. So it seems that some royalties will go from Ferndale right on over to Sir Paul. Merry Christmas to him, and to all, and good night.